Organic wholemeal rye bread with oats, barley and flaxseed. 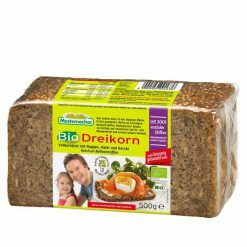 This organic wholemeal rye bread is made with freshly in-house ground organic whole rye kernels, organic whole rye flour, oats, organic barley and organic linseed. It is also coated with organic sesame seeds. Delicious and healthy, this bread can be enjoyed as a meal or snack with your favourite topping.